More and more frustrated Lewis pairs (FLP, see part 6) see the light of day. The ultimate aim is reversible hydrogen storage but creating a metal-free hydrogenation catalyst is also worth the effort. Theuergarten et al. (DOI) have prepared pyrazolium-borate 3 from pyrazole 1 and bis(pentafluorophenyl)borane 2 as the trans isomer. Dehydrogenation with another FLP 4 forms pyrazolylborane 5 which easily takes up hydrogen again now to the cis-isomer. 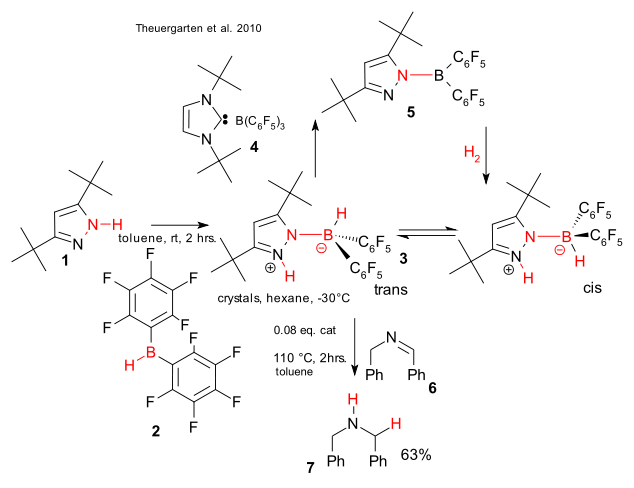 The trans isomer is a metal-free hydrogenation catalyst for N-(benzylidene)benzylamine 6 to dibenzylamine 7. Update 22-02-2011: added missing bonds in image. Thanks to reader K. for spotting the error.